Here’s my thoughts on the BCB Crusader II mug. It’s made of hard anodised aluminium and weighs significantly less than the Crusader Cup Canteen. I don’t post a lot of gear reviews but a metal mug is one of my key items of personal kit. 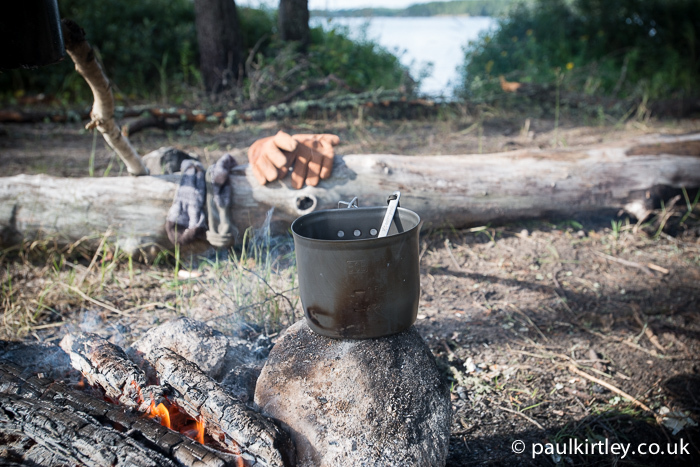 In my view, being able to boil water is an important function of your core outdoor equipment. Also, I’m always looking for weight savings or performance improvements from my core wilderness and outdoor living kit. So, I was interested to try the mark II mug to see how it compared to the classic stainless steel Crusader mug I’ve used for years, particularly in terms of durability. Great review with the right thougts in mind. Test it for a period and give your honest opinion. Out of the box reviews can only be 50% legit at most. Agreed Rody. I can’t see how else you can make a proper review. Thanks for another great and informative video Paul. Yep have one myself and its pretty bombproof. I got mine with the case as well which all works. I love the idea (and the expression) of a brew kit and wondered exactly what you carry in yours. Hi Paul thank you for the review, I do not have the Mk 2 at moment hopefully will get one at sometime but till I do I will still use my old ss version I have also got a stainless lid for mine, do you know if BCB will be making a lid for the Mk 2 ? I have a ‘heavy cover’ stainless lid which I bought for my Mk1 mug, and it fits the crusader Mk 2 well. The weight difference between the lid and the Mk2 mug is now very apparent. It would be great if an aluminium lid was available. I might make one myself next Winter. There are aluminium lids for Mk1 and Mk2 Crusader mugs available on eBay at present (Feb 2016). I have bought a couple for my Mk1 and found them very good. I also have a stainless “heavy” lid that is a bit too heavy imho – I’ve not carried it regularly if I’m backpacking any distance but have then suffered the disadvantages of smoky water. The aluminium ones are a good alternative and worth making an offer on – I got a couple for £7 each. what are the dimentions of the pouch you use? it looks really useful, but after looking around they are rather costly! Heh, I use a 900mL Evernew (EA252) for three-season, and Open Country 2L for winter. Been considering downsizing to about 475 mL mug instead of 900 mL though since the Evernew is good enough for soups and cooking meals for two. Also considering picking up 4L pot from Open Country for melting water for two people. The wilderness trappers in my area of Canada use beer cans as pots though. Either normal Molson’s, Kokanee or they get a brand known to sell chuggers like Lucky or Foster. Definitely lighter than anything I see on the hiking market (except for cottage industry), but I am still skeptical of the BPA linings used in those cans. Brilliant concise video as usual Paul, visually looking very professional. Are you using a filter when filming or was it naturally good lighting? I’m looking at making a short mini doc and any tips would be grand. Great review thank you. I particularly found he use of the complete brew kit ystem useful.What was the pouch again? Thanks for your review. Your advice has helped me many times on the way to becoming a better camper. It is good to know how to lighten my kit weight. I will get one and try it out. Please keep writing! I hope to read lots more! Have to say I still like the stainless steel version, tried both for at least 6 months and like the mark 1 for having a lip to drink safely not to hot and the stainless steel to me at least is easy to clean with any material and therefore a little more hygienic. At least i know it good used one since they came out. That is one big mug of coffee. I like your review and I understand that it is 100 grams lighter. but I will stick with the original crusader mug as I think it is bomb proof. I have the standard one BCB steel mug and it works very well but carrying it on the belt sometimes it is heavy so the new lighter version would be welcome. I’ll purchase it as soon as possible. 1. Does the mug fit over the old US american 1 quart / 1 liter plastic bottle and the Nagelne in military form too? And so tight, that i get it together in its bag? 2. Does the filled mug and its handle survive, if you stand it directly on the amber of oak or beech? 3. Do you use the socks in the foto for water filtration or as tee bags? If you were looking to buy a first one now, based your experience to date, would you go with the old stainless steel one or the new aluminium one? I watched your video with interest and duly bought the Mark II cup. Although the increased size will be useful and the material seems as strong as, and lighter than the stainless steel Mark I cup, I do not like the indented base to the cup. For drinks, it’ll be fine but quite often I make porridge in my cup and trying to get the remnants of the gummy, oaty residue out is going to be a bit of a trial; the stainless Mark I version has a flat bottom to it, making it that bit easier to use.